When numbering carbons on the ring, we can start counting from either the methyl group (1-methyl...), or the isopropyl group (1-isopropyl...). Which one should I start with? Or do I need to start numbering with the substituent which name comes first, alphabetically? I set the carbon number 1 on the methyl substituent, giving me the following name: 1-methyl-2-isopropylcyclohexane. However, my book says the correct name is: 1-isopropyl-2-methylcyclohexane. So the solution managed to sort the name both numerically and alphabetically. Is this what I need to do? Is the name I gave incorrect? Which prefixes count towards alphabetically-naming a compound? Which prefixes don't? All I know is that the numeric prefixes like di- or tri- don't count. Are there any others which don't count either? 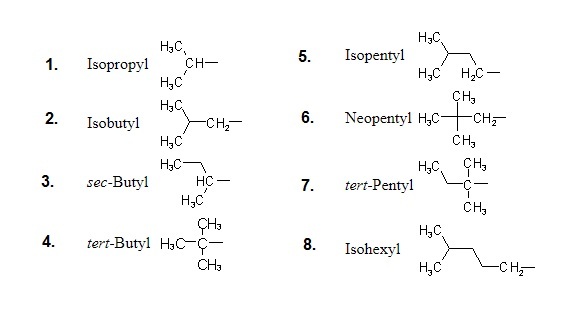 Simple prefixes (simple substituent groups such as methyl and isopropyl) are arranged alphabetically disregarding any multiplicative prefixes. Any multiplicative prefixes are inserted later and do not alter the alphabetical order. For example, ‘methyl’ is considered to begin with ‘m’; ‘isopropyl’ is considered to begin with ‘i’. Alphanumerical order is used to establish the order of citation of detachable substituent prefixes (not the detachable saturation prefixes, hydro and dehydro), and the numbering of a chain, ring, or ring system when a choice is possible. P-14.5.1 Simple prefixes (i.e., those describing atoms and unsubstituted substituents) are arranged alphabetically; multiplicative prefixes, if necessary, are then inserted and do not alter the alphabetical order already established. Thus, the correct alphanumerical order in your example corresponds to the name x-isopropyl-y-methylcyclohexane. Note that Rule f takes precedence over Rule g; however, Rule f does not permit a decision to be reached between ‘1-isopropyl-2-methylcyclohexane’ and ‘2-isopropyl-1-methylcyclohexane’ since both names correspond to the locant set ‘1,2’. 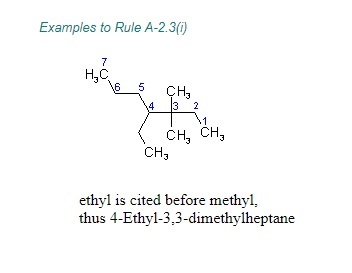 According to Rule g, your example is named as 1-isopropyl-2-methylcyclohexane rather than 2-isopropyl-1-methylcyclohexane since isopropyl is cited first as a prefix in the name. Note, however, that the prefix ‘isopropyl’ is retained for use in general nomenclature but the preferred IUPAC name is ‘propan-2-yl’. Therefore, the preferred IUPAC name for your example is actually 1-methyl-2-(propan-2-yl)cyclohexane because ‘methyl’ is cited first in the name (since alphabetical order is used to establish the order of citation of substituent prefixes in the name). Let me first quote some rules given by IUPAC (1) and then come to your question. For arranging substituents , which are treated as prefixes the following rule is followed. Now comming to your question , it has two substituents methyl and isopropyl at equivalent positions. Using rule 2.4 and R-0.1.8 , numbering is started from isopropyl end and named. R, S Configuration and Branching - Which Path? 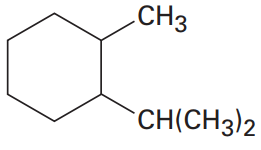 Why is this cycloalkane name giving the lower number to methyls over ethyl? 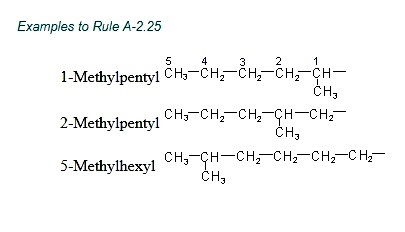 What is the correct name for 2,4-diethyl-4-ethoxyhexane?